Early afternoon in downtown Los Angeles and the rush-hour traffic is starting to build. Among the rows of SUVs and fashionable convertibles, one familiar image wends its way through the stationary vehicles - a yellow school bus. From the Hollywood sign on this coast to the Statue of Liberty on the other, few images of America are more iconic. Each day the Los Angeles Unified School District ferries 82,700 children to and from school in more than 2,100 buses. 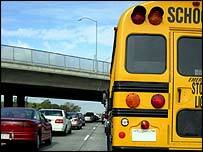 School buses are the largest mass transit system in the United States. Across the country some 450,000 take more than 25 million children to and from school. Their colour - National School Bus Chrome Yellow - was first adopted in 1939. It was decided that a uniform colour for school buses was needed and the yellow that is still used today was chosen for its high visibility. Full-size school buses can seat 45 to 70 passengers. But there are in fact not one but seven different types. Nowadays the buses are required to meet demanding federal safety standards involving body and chassis construction, mirror performance and exterior safety devices such as "stop" arms and warning light systems for other motorists. The yellow school bus is an American success story. It is cost-effective with a safety record unequalled within the transportation industry. According to the National Safety Council, the school bus is actually the safest form of ground transportation. Statistically they are 40 times safer than family cars. The training and certification standards for the nation's bus drivers are high. To qualify they must obtain a commercial driver's licence with a passenger endorsement and pass school bus-specific driving tests. They also face drug and alcohol testing and criminal background checks. The editor of School Bus Magazine, Steve Hirano, believes the US school bus has become an American icon because of its unmatched safety record - much of which is down to this dedicated legion of bus drivers. "Their contribution to the overall safety of school bus transportation should not be underestimated," he said. "Manoeuvring a 40-foot vehicle through tight traffic is an incredible feat, but school bus drivers are accustomed to handling traffic congestion even as they're monitoring the behaviour of 70 children in their rear-view mirrors." A report for the Sutton Trust education charity in England says town, city and state governments in the US fund the buses - in general there is no federal subsidy. Parents are increasingly being charged a fee, where state law allows. 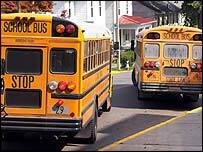 Rules on who gets free travel vary, but typically involve anyone living more than one mile from school. Steve Hirano believes there are lessons to be learnt from the yellow school buses. "I certainly think the US version of school transportation would be a fantastic model for other countries around the world," he said. "Many American parents take the school bus for granted, mainly because it has always worked so well. "